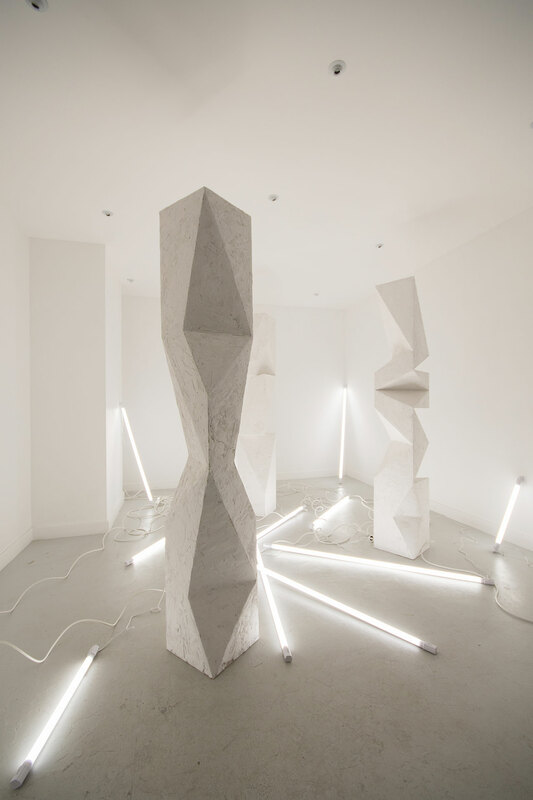 Aldo Chaparro, Until the quiet comes (Installation view at Aldo Chaparro Studio). Burned wood and neon light. 2014. Courtesy PEANA Projects. 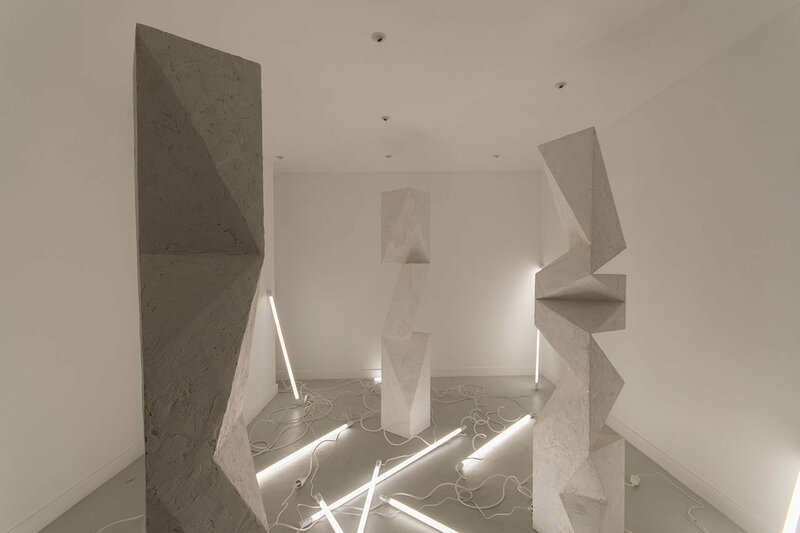 Famous for his large-scale architectural and sculptural installations, Peruvian-born artist and prolific editor Aldo Chaparro presents a pair of site-specific installations at Amastan Hotel in Paris. 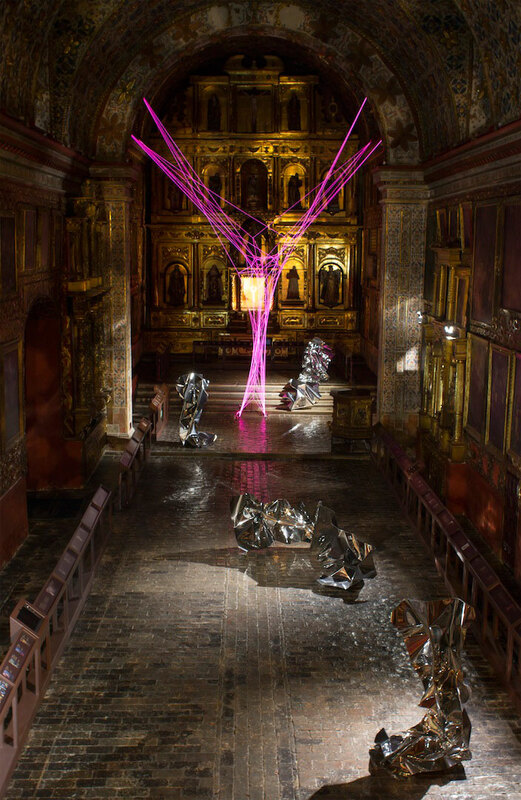 The result of a collaboration between PEANA Projects and Amastan, the two installations showcase the architectural sensibility and unique use of texture and light that Chaparro is so well-known for. 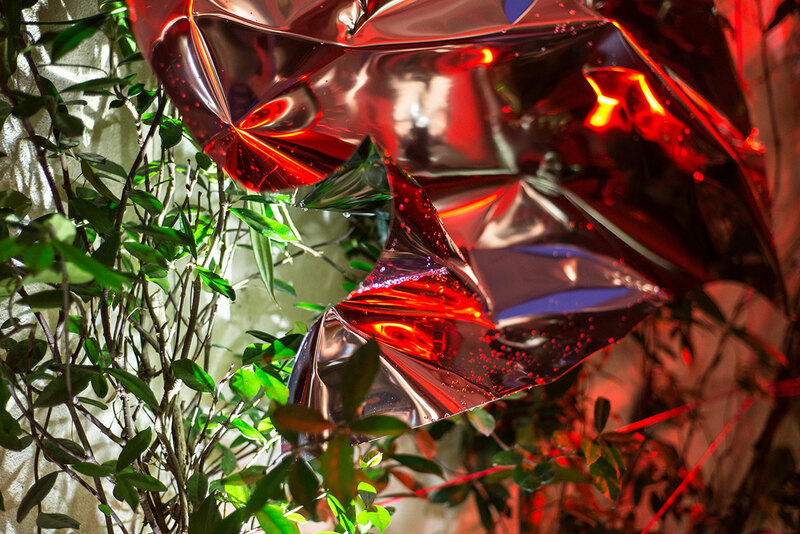 In the hotel’s pop-up space, a luminous installation of neon lights and totem-like sculptures create an otherworldly atmosphere that highlights the mystical nature of Chaparro’s work, whereas the neon-string and metal installation located in the courtyard purposely blends with existing plants to create a surreal jungle collage of nature, architecture and hi-tech materials. Aldo Chaparro, Portal. 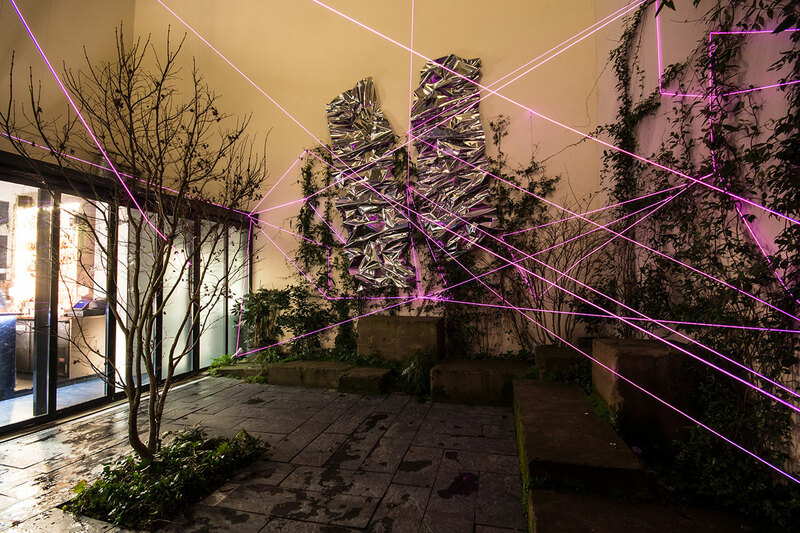 Stainless steel and electroluminescent wires installation. 2013. 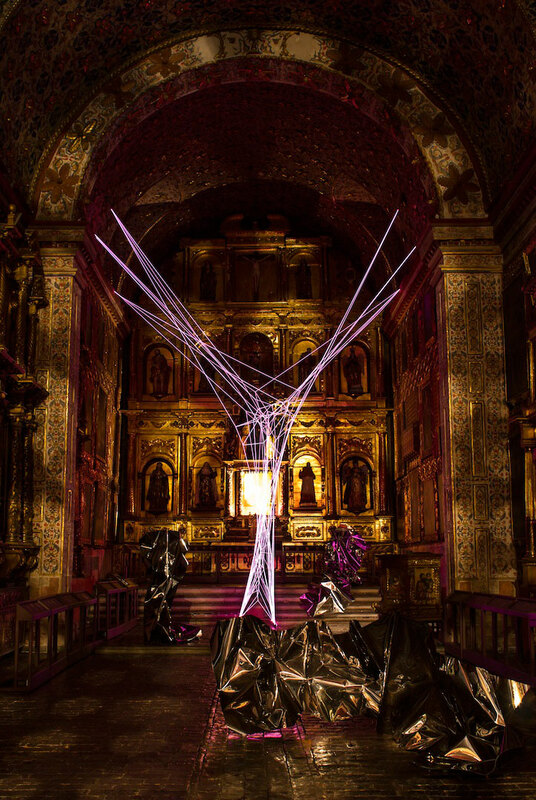 Installation view at the Church of Santa Clara in Bogotá, Colombia. Photo by Manuel Velazquez, courtesy PEANA Projects. When did you start working with light and what is it that attracts you to this medium? 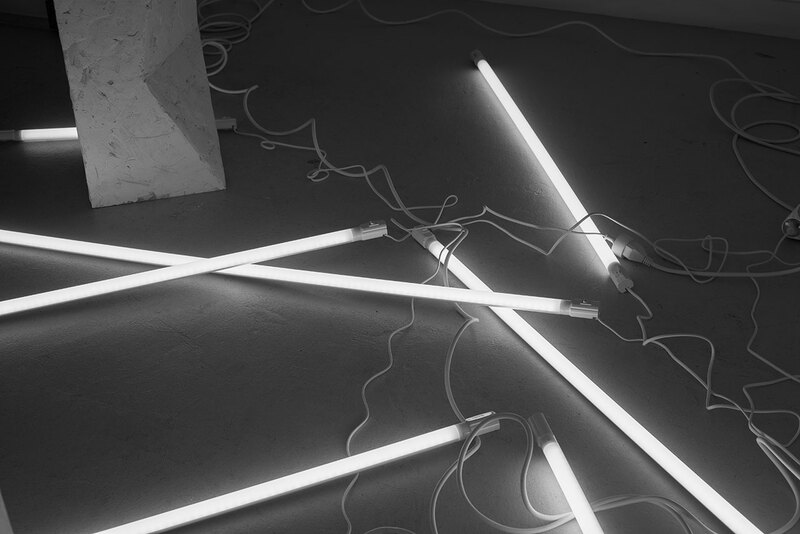 Volume and light are two notions that collaborate constantly. Light collaborates with form, accentuating volumes or even defining them; you can’t work with a volume without thinking about how light will inevitably affect it. For me light is a very powerful element that affects our perception of space, even emotionally: a single light bulb can fill a place and even play a sculptural role, not only because it allows us to see and feel the space but also because, somehow, the light takes the form of the space that contains it. 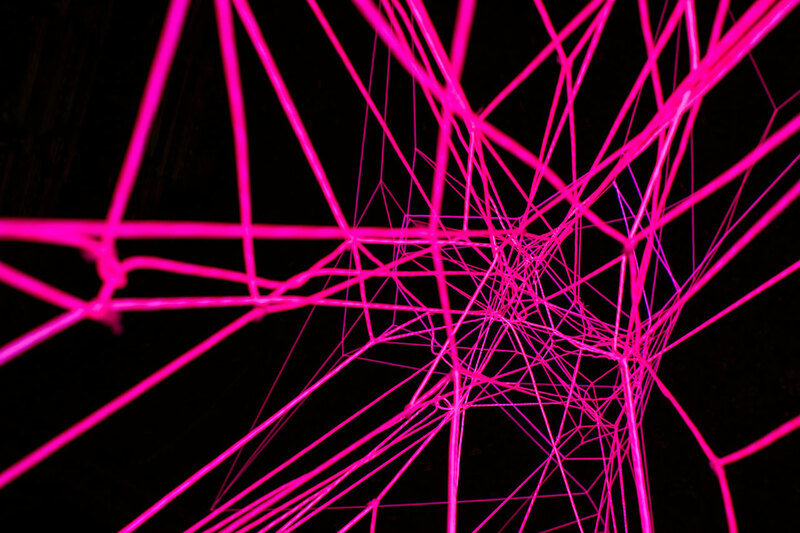 How did you make the fluorescent string installations like the one currently on view at Amastan? The title of this piece has been ‘Spider web’ ever since I first installed it which ultimately describes what it does and how it is installed. Once it identifies the space where the web will be built, the spider must improvise: if you have four points of support the shape of the web will be defined by this feature, similarly, if you have only two points the ‘spider’ will have to make all their decisions based on that. 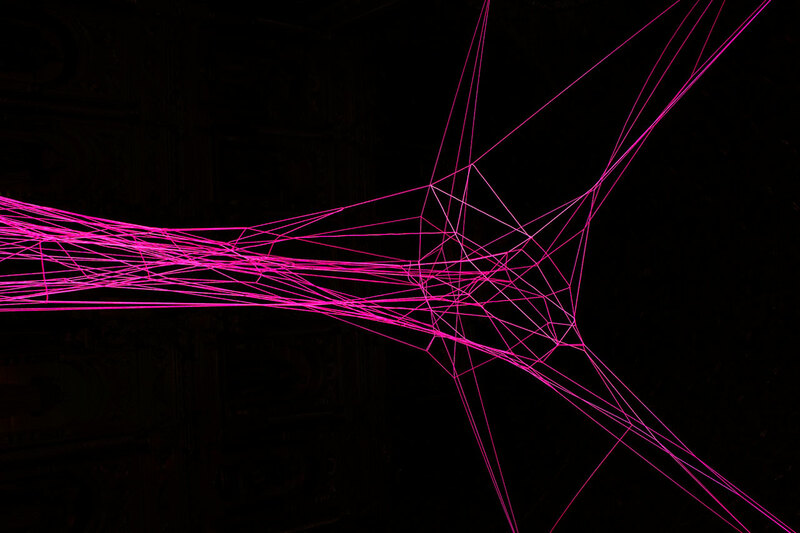 This is basically what I do with ‘Spider Web’, it’s a piece that adapts to the space it touches, and its shape will absolutely depend on this circumstance. Could you tell us a few words about the relationship between your work and architectural spaces? I believe that the concepts around sculpture are implicit in architecture: the use of volume, surface, materiality and of positive and negative spaces is something that corresponds to both disciplines. That is why, in my work, the correlations between both disciplines occur from the very moment of each work’s conception. I am very interested in site-specific installations because they represent a challenge for me, where I have to create work that will be in dialogue with, comment upon and integrate the architecture of the space in an organic and natural way. Aldo Chaparro, NaCL(í). Stainless steel and electroluminescent wires. Variable measures. 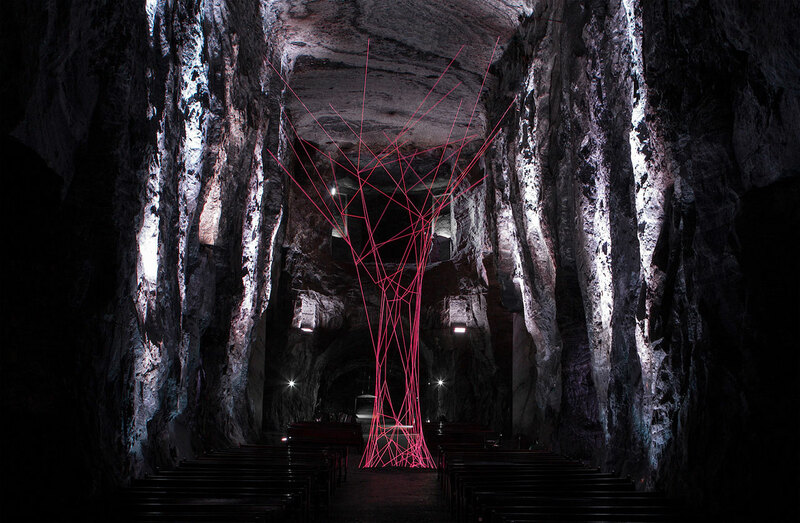 Installation view at the central hall of the Salt Cathedral of Zipaquirá, Colombia. Photo by Manuel Velázquez. Courtesy PEANA Projects. Aldo Chaparro, October 23, 2014. Golden aluminium and electrostatic paint. 160 x 125 cm. 2014. Photo courtesy PEANA Projects. Aldo Chaparro, February 17, 2013. Stainless steel. 140 x 270 cm. 2013. Courtesy PEANA Projects. Many of your sculptures, like the white ones presented currently at Amastan, display a particular, very recognisable geometry. Could you describe where the shapes and volumes seen in these works come from? Is there a specific process or reference in them? Many cultures have used totems. In recent years I have shifted my focus from contemporary culture to primitive cultures, for example, I’m very interested in the art of Polynesia, African art, as well as Mayan and Aztec civilisations. In fact, I was born in Peru, and as a child I lived in front of a pre-Columbian pyramid. I’m sure that the presence of this building in front of my window every day affected my perception of volume and space forever. I think it was one of the detonators of my interest in sculpture. So do you see your totem-like works as mystical or spiritual in any way? Absolutely. In the history of mankind, totems have been tools that seek to connect the earthly with what is above, with the divine. They are in a way like staircases, or channels of communication, and represent man’s desire to reach his god. 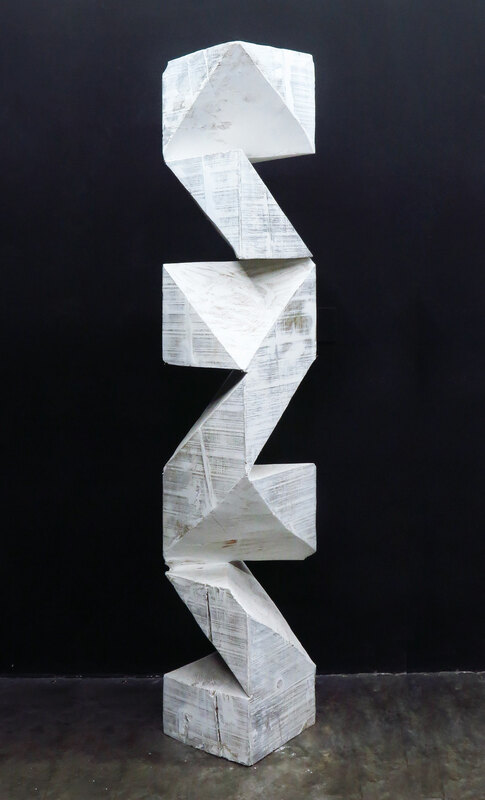 Aldo Chaparro, Totem, plaster on wood, 30 x 30 x 120 cm, 2014. Courtesy PEANA Projects. 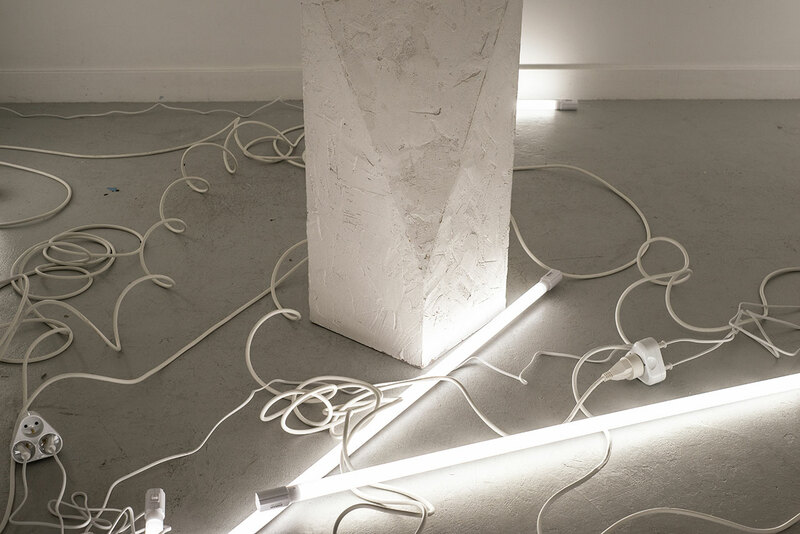 Aldo Chaparro site-specific installation at Amastan Paris. 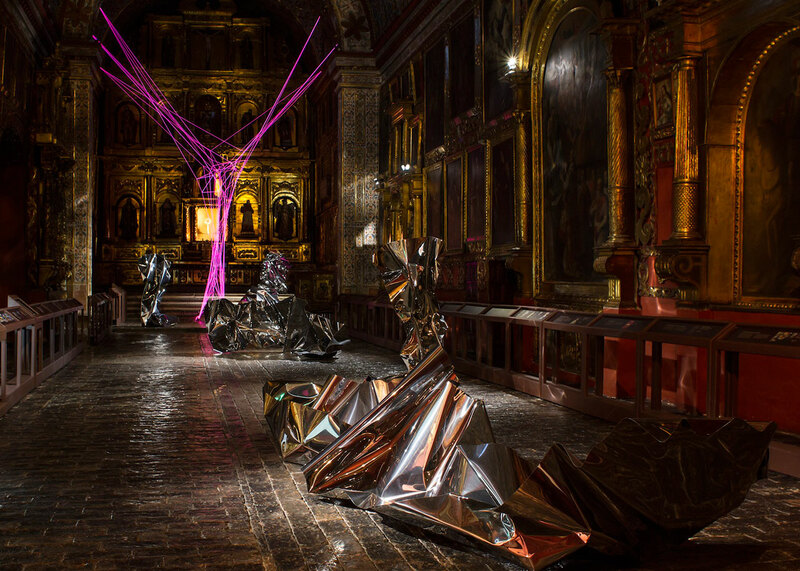 Photo courtesy the artist, Amastan Paris and PEANA Projects. 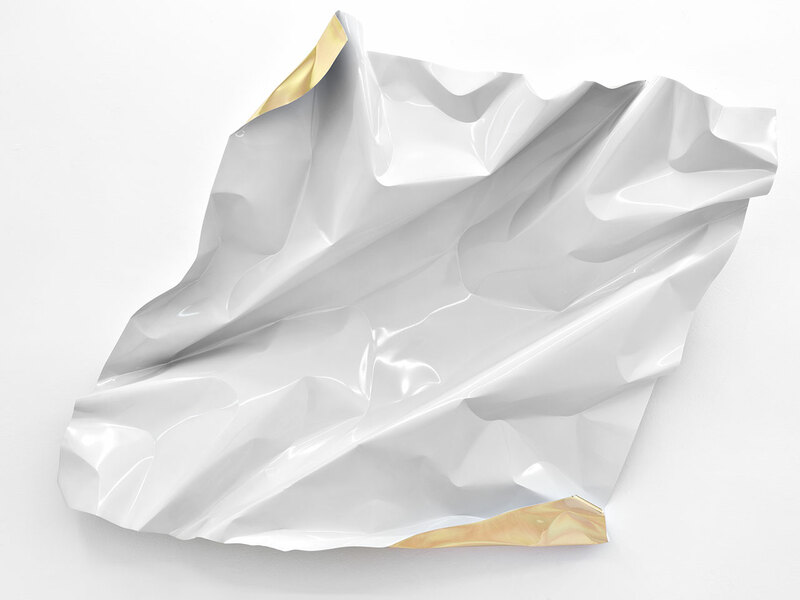 You often use crumbled sheets of glossy metal in your work. How did you arrive at this way of working and what does it mean to you? These pieces were originally acrylic which I heated with a torch and then wrinkled. But after a while I began to feel that something bothered me. 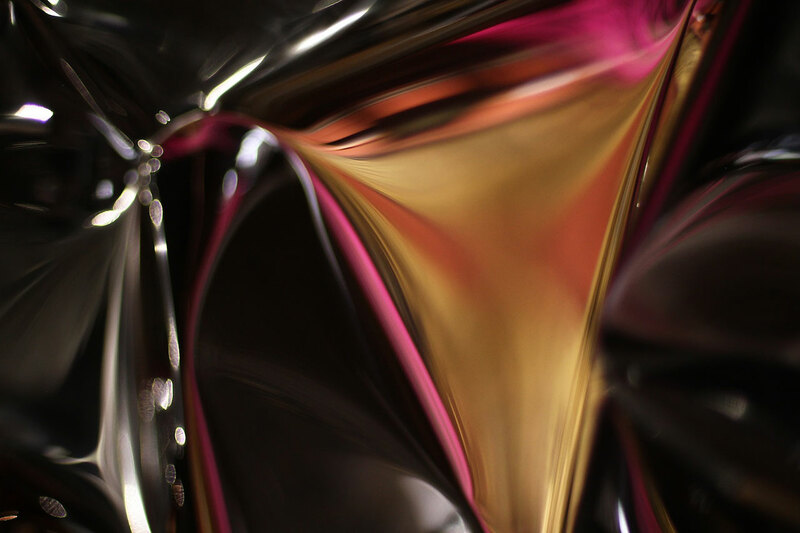 I discovered that it was the torch, the tool, the interface between the material and myself. 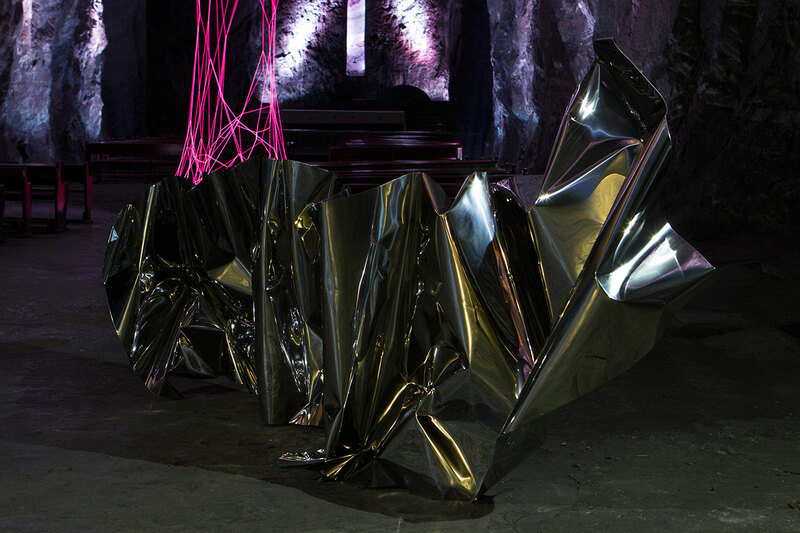 I needed a material that I could work directly with my body; that’s why the process of making the pieces in steel is half dance, half fight; a fight where the matter fights to preserve its form and I struggle to transform it. These works are the result of a fast process, because I’m interested in those kinds of processes: in a long process, it’s often the skill that you have developed alone that speaks, while your mind is on other things. It’s important for me to live in the present, that’s why the titles of those pieces are in fact the hour, day, month, year and the place in which they were made. My state of mind, strength, weight, the moment I create the piece ... all influence the result — each piece is unique, it’s a snapshot of the moment when it was created.